Many of us may notice that when we spend time in Mother Nature, we may noticeably feel a little better and may even notice a sense of ease. The really incredible thing about spending time in the forest is that there’s LITERALLY science to back up why we feel so amazing and what it’s providing for us on a biochemical level. The Japanese have been practicing what’s called “Shinrin Yoku,” which roughly translates to “Forest Bathing” or the concept of, “taking in the forest” since the early 1980s. It’s such an effective therapy and it’s an officially accepted method of preventing illness that universities study it and hospitals recommend it in Japan. I’ve been spending a lot more time in the woods lately (we got a cute little lab puppy in the fall named Stella so that’s helped too), but I’ve significantly noticed that the forest will always put me into a good mood and I leave much happier and more energetic than when I’ve entered. It gets you out and moving, but you AREN’T required to do crazy activity in the woods to experience the numerous benefits. Strolling through the woods is what my prescriptions list. The goal with this form of exercise isn’t aerobic exercise…that’s for another time and place. The goal is to enjoy your time by yourself, with family, friends or pets and gaze upon the wonders of nature. It’s also great for those with back and neck pain. Gently gazing around the woods at the beautiful trees and catching sight of songbirds chirping around you over-head can be a great way to get that neck and back moving without doing more of those boring exercises. If you live somewhere that it’s sunny (or have days off during our never ending winter when the sun is actually out), your body will also benefit from sun exposure to produce its very own vitamin D! Here in Canada so many of us are deficient (myself included!) that we end up having to take vitamin D supplements. Getting outside in the sun (while avoiding burns!) is a great way to help support and boost your immune health, and your bone health through those vitamin D levels. The reason that you feel so good in the forest or the woods is that the trees are literally releasing substances that help to lower your stress levels by decreasing your stress hormone called cortisol. These substances the trees are releasing are called terpenes. These terpenes have been found to decrease your stress and overwhelm just by breathing them in…so take nice big deep breaths in the woods! Not only are you literally breathing in the goodness (and oxygen from the trees), but the beauty of nature and re-connecting with our ancestral roots is great for our wellbeing. On top of boosting your vitamin D levels which helps to support your immune system, the other amazing benefit of spending time outdoors and amongst the trees is that it’s been found that the terpenes the trees are releasing are also increasing the number of your natural killer cells and making them more active for longer periods of time. Natural killer cells are a type of white blood cell that acts as soldiers in the body, searching for trouble makers like viruses and bacteria. This is seen to help battle colds and flus but also appears to have anti-cancer properties as well! This is probably the biggest benefit that I think patients like you can glean from spending time in the forest or the woods. So many of us are completely overwhelmed and overloaded from head to toe with stressors from our modern daily lives. It’s the constant cell phone and laptop exposure, the never-ending work emails, the struggle to find work-life balance and dealing with all of the physical, mental and emotional stressors that are inflicted upon our bodies every single day. Literally stopping to smell the flowers, run your hands through the leaves and enjoy the beauty of filtered sunlight through the trees is a great coping mechanism to keep up with how our bodies and minds feels. Hanging out in the woods provides movement, vitamin D, immune system boosting, stress decreasing and a way for us to breathe in some highly oxygenated air. 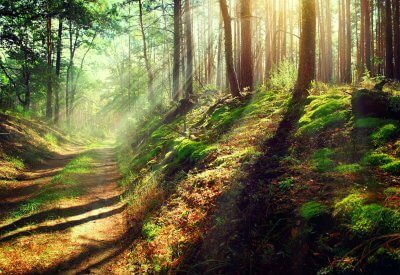 Want to know more about the health benefits of forest bathing or to optimize your health and wellness? Let’s get you booked in for a FREE 15-minute meet and greet and we can see if we’d be a good fit to work together!